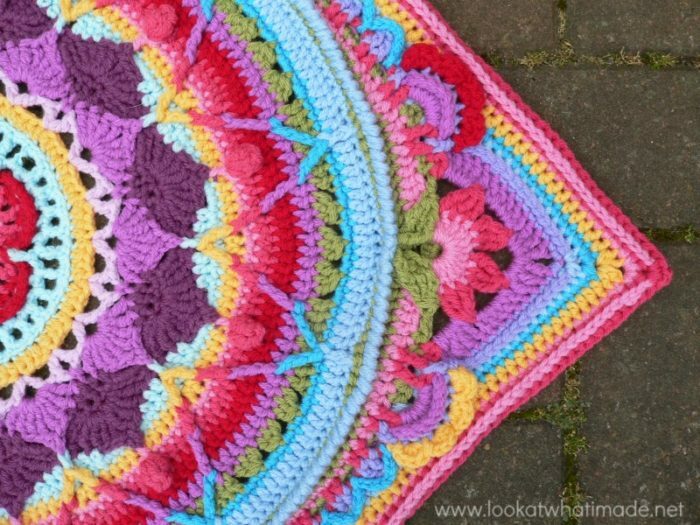 I know there are a few of you who have been patiently (and impatiently) waiting for the pattern for Sophie’s Garden, so I am excited and relieved to finally share it with you. The example above was made using 2 strands of Stylecraft Special Dk and a 5.5 mm hook. You can now find a list of the colours I used HERE. Although this is not officially part of the Block a Week CAL 2014, I know there are a few ladies who are wanting to incorporate this square into their blankets. 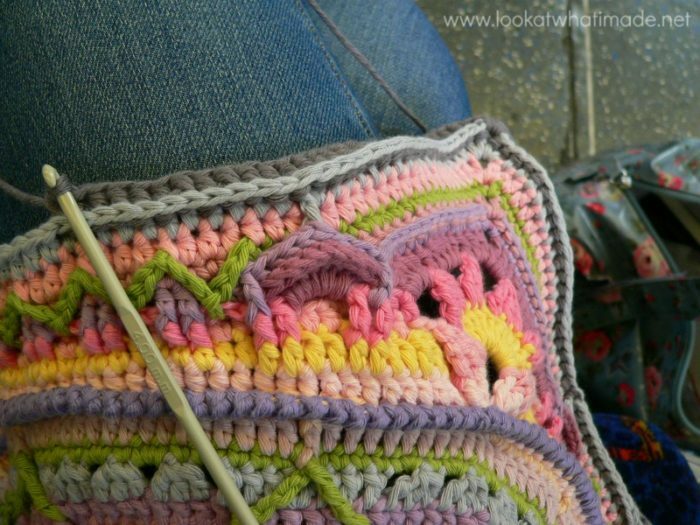 If you wish to do so, remember to use the same hook and yarn as for the rest of your squares and it will come out the same size as 4 of the other squares. Have fun! I am off to eat some Chinese and have me a big glass of wine!! ©Dedri Uys 2014. All Rights Reserved. Special design credit to Chris Simon for the use of a modified version of her Lace Petals flower. 8 rows and 18 st’s per 4” (10 cm) square. 19” (48 cm) in diameter. Using a gauge of 7 rows and 16 st’s per 4” (10 cm) square, your final size will be roughly 22” (56 cm). I get this gauge by using a 5.5 mm crochet hook (US 9/I UK 5) and worsted weight yarn. Using a gauge of 6 rows and 14 st’s per 4” (10 cm) square, your final size will be roughly 24” (61 cm). I get this gauge by using bulky yarn and a 6 mm crochet hook (US 10/J UK 4) OR 2 strands of double knit yarn and a 5.5 mm crochet hook (US 9/I UK 5). Update 2/3/15: Sophie’s Garden is now growing into Sophie’s Universe. I have removed the photo tutorial that used to live here and I have added links to the new and improved tutorials. The instructions remain the same, so if you were in the middle of a round, just hop over to the new tutorial and continue on. 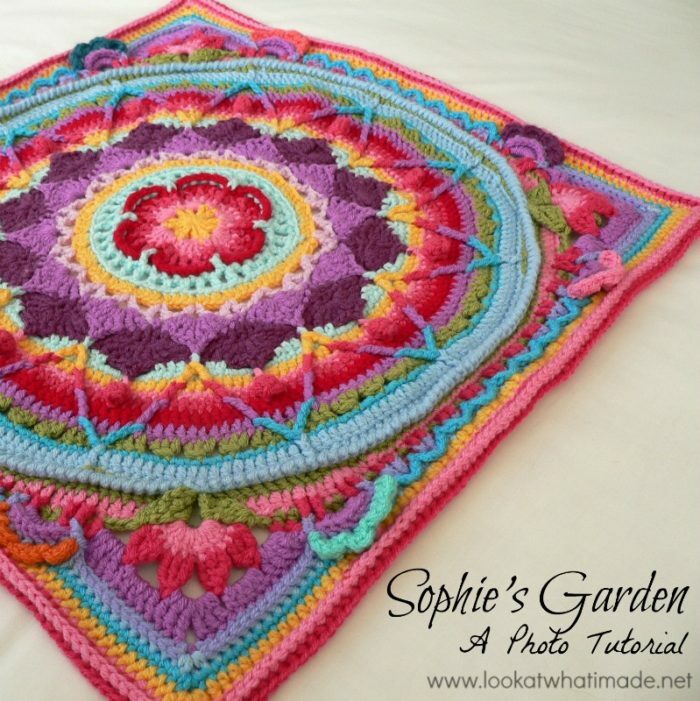 Part 1: The instructions for Rounds 1 – 8 can be found HERE as Part 1 of Sophie’s Universe. Part 2: The instructions for Rounds 9 – 15 can be found HERE as Part 2 of Sophie’s Universe. 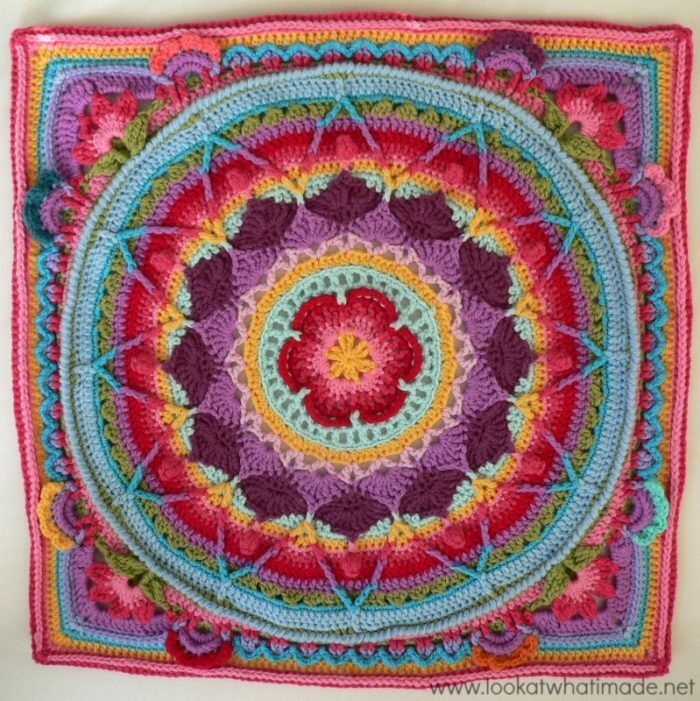 Part 3: The instructions for Rounds 16 – 25 can be found HERE as Part 3 of Sophie’s Universe. Part 4: The instructions for Rounds 26 – 36 can be found HERE as Part 4 of Sophie’s Universe. Thank you to Kimberly Slifer, Claire Martin, Beth Spaulding, and Venetia Smith for testing and proofing this pattern for me! Dedri is away on a crochet cruise at the moment. Have you looked at the Around The Bases pattern (Google finds it easily)? That may help you. I hope that’s ok with you. Hi Bonnie. I don’t quite understand what you mean. Hi Bonnie. I haven’t received a previous comment from you about this, nor an email. The only comment I can see is the one you made about changing the name of the pattern? You are welcome to start with a chain stitch instead of a magic ring. Hello, I’ve been crocheting since I was 13, I’m 64 now, my aunty taught me, she was amazing at doing all sorts of crafts but crocheting was my favourite, you can shut yourself off and ignore the nastiness that’s going on in the world, I have made so many different things and sold loads, I’m going to make this square into a cushion for my beautiful granddaughter as her name is Sophie, wonderful, thank you for this beautiful pattern. Dedri, I see there is a kit you can buy but I don’t see one for the size “large”. Is there one? Thanks much. This is going to be my winter project this year. I made this last year as a gift to my daughter. I did run into very few “glitches,” but I’m not sure they were “glitches,” they could have been me. But by looking at the photos and the video, i could figure it out. I’m so grateful for the pattern and all the lessons I learned making this. It was my first attempt at this type of crochet. My daughter absolutely loves it and uses it as a wall hanging, or over her bedspread, or as a throw, a headboard, whatever . . .
I’ve been crocheting since I was 7 and I’m 73 now. My mom used to tat and crochet tablecloths, doilies, bedspreads, pillow cases, you name it, with fine crochet thread. She taught me how and I learned by just sitting next to her and watching her as I worked on practtce yarn. She’s the one who taught me that being able to crochet is a gift. It is timeless. Sometimes I crochet until my fingers seize up — it’s a great way to release stress and it becomes meditative with the hundreds of repetitive movements. It’s a dynamite communication between my brain and my fingers. It keeps the brain active and it can also be a time for reflection. With my hands engaged and my brain sending signals, I find myself in another state. Crochet, for me, is not just “crafting,” it’s so much more than that. It’s engaging, it is soothing and can be mindless and mindful. It’s a good time to daydream. I can remember asking my mom once, “If I find a small mistake a few rows back, should I go back and rip it out?” Her answer was “Do what you want, but remember that you are the only one that will notice the error and some day someone will treasure that “mistake.” It was a good way of learning how to accept mistakes as learning opportunities. My mom crocheted beautifully — designed her own patterns and stitches — and I have so many beautiful holiday ornaments in crochet thread, but the one thing that she made that I treasure the most, is an afghan. It was the last one she made at 91 and she wanted to finish it before she moved on. At this point she was having trouble seeing and kept losing count, but she poured her heart and soul into it — I can only imagine all the thoughts that must have gone through her head as she rushed to get it done. She did . . . barely. It is offwhite. It isn’t a square, but an obtuse trapezoid . . . sort of . . . but it’s warm, it’s beautiful, and it’s priceless. It is soft and heavy with sentiment. So remember, when you craft a piece of art, give it to someone who will treasure and care for it. It’s a chunk of yourself. Thank you. It must be wonderful to wrap her love around you. So far I have made two of these squares, and I love them! My goal is a large blanket, assuming I can continue to get the yarn as I go along. Can’t buy it all at once. I am wondering if you would block the squares? I’m using CotLin DK which is machine washable and dryable. I’ve been told you don’t block unless you plan to block each time it’s washed. Certainly, I can’t block a large blanket! What would you do? Want to also let you know that this tutorial is very clear and concise, and there is no way to mess up unless you fail to follow directions. Thanks so much for that!